I think it’s time you met my guy. But first, there are somethings you should know about him. He’s always happy. I mean always. In the morning, in the evenings—it doesn’t matter. He’s happy. I don’t know how he isn’t completely exhausted from all the happiness! He’s always ALWAYS excited to see me, and usually can’t contain himself. And he also loves to eat. He usually eats like this is the last time he will ever see food again and scarfs it down. I mean, I love to eat and all, but I don’t understand his overdeveloped sense of …hunger. You may be wondering how we met. Well, it’s a long story, but I know his dad (who is pretty cool), and my parents kept him a surprise for my birthday. Best birthday present ever! And my parents did a really good job keeping it a secret. Okay, okay, I know you’re dying to know what he looks like. But I’m warning you, he’s got a lot of hair. And he has the cutest ears. But he is so so handsome. He’s irresistible! Yep, he’s my puppy. (Who’d you think I was talking about?!) 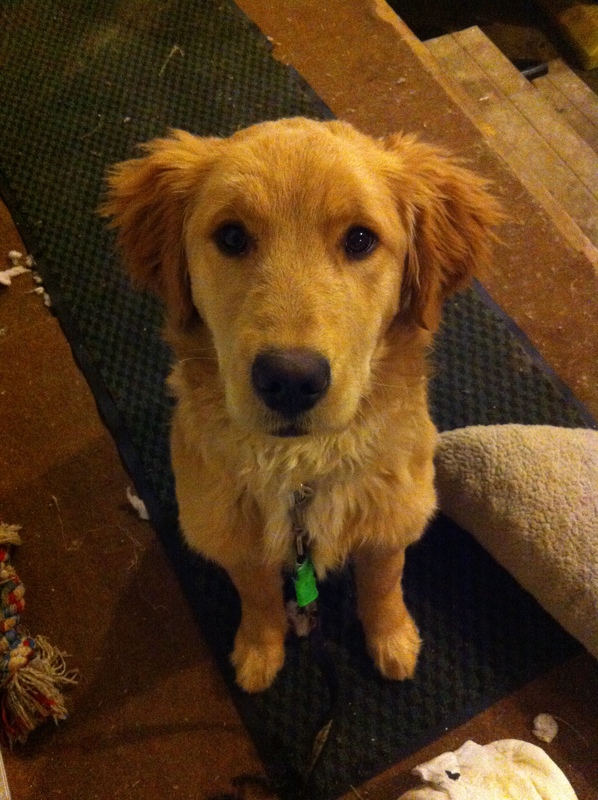 He’s a five-month-old Golden Retriever named Rockwell (yes, after the painter, Norman Rockwell). And he’s teaching me a lot about life! He’s a wiseguy, er…wisedog. Take today for example: We had a few really nice, warm days here, making us all excited for spring. This winter has been long, and cold, and snowy, and hard, and snowy, and really cold (oh, did I already say that?) and we’re all ready for spring. And I’m one of the crazies who actually likes Michigan winters! Well, as ready for spring as we might be, today we woke to 8 inches of snow. Yesterday it started raining, the temps plunged, and then dumped more snow on us overnight. And it didn’t stop snowing until this afternoon…then the sun came out! Welcome to Michigan. But you know what Rockwell did today? Played in the snow. Yep, and he loved every minute of it! He digs down deep in it, and chases little snowballs that roll in front of him. And he loves climbing the mountains of snow that are created by the plow. 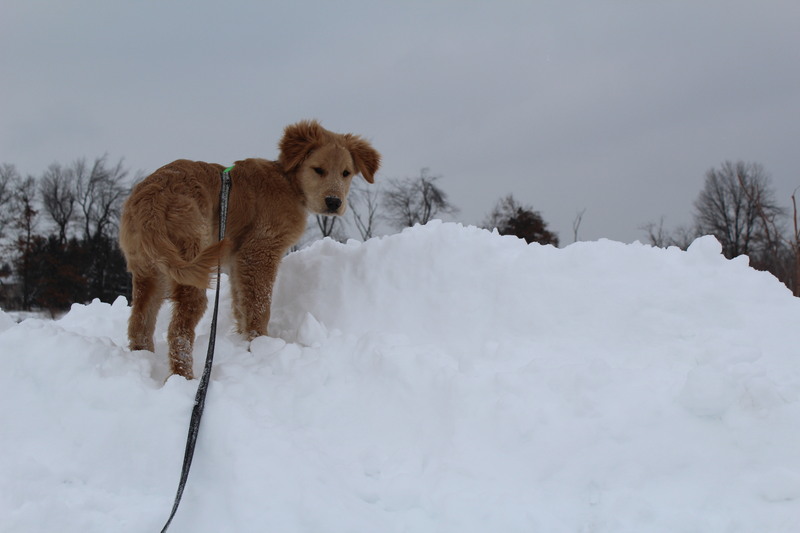 He was not discouraged by the snow at all. He loved it. He was happy. That sounds like a simple lesson, but it’s necessary on a day like today—when all you want to do is go back to bed and pull the covers over your head because of the snow. Get up and enjoy the snow—it won’t be here forever (thankfully!) and since you can’t change the weather, you might as well enjoy it! Rockwell is teaching me a ton of other important things, too, like love, friendship, and what it’s like to have a toddler! So I’m curious…have you ever learned from your puppy? What has your dog taught you about life?